Robert Dundas (1685–1753) was a lawyer and politician. He served as Solicitor General for Scotland from 1717 to 1720 and as Lord Advocate from 1720 to 1725. He was also a Member of Parliament from 1722 to 1737. In 1726, he commissioned the architect William Adam to design a new house at Arniston. Adam was then working on Sir John Clerk’s nearby house at Mavisbank, but Arniston was to be a somewhat larger house. It was built over the foundations of the original 17th-century house, but Dundas ran out of money during the building works, which were only completed after 1753. 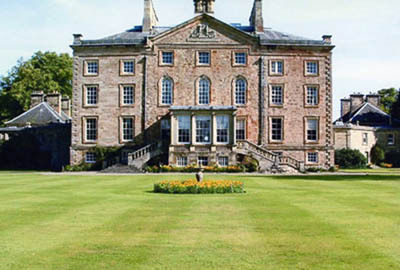 By this time, William Adam was dead, and the design for the western part of the house was provided by his eldest son John Adam (1721–1792), for Robert Dundas’ son Robert Dundas, of Arniston, the younger (1713–1787). In 1872, a new entrance hall was added to the north front by the architects Wardrop and Brown. The house is still occupied by members of the Dundas family who, in the summer months, open the house to the public and lead guided tours. Floral carpet on a chequered ground with stylised acanthus centre piece and rococo main border. Two tone exchiquier ground of parallelograms separated by diamonds all in dark and light browns. Two designs of formal rosettes in the lines of diamonds, one a simple outlined quatrefoil, the second a solid brown star shape. Centrepiece of formal acanthus sprays springing from a small central circlet enclosing a tiny rosette. Main border on a dark brown ground, acanthus and hop flowers, with two cockle shells in each side and shells at the corners. Outer border egg and dart also with two-tone pink striped guards.